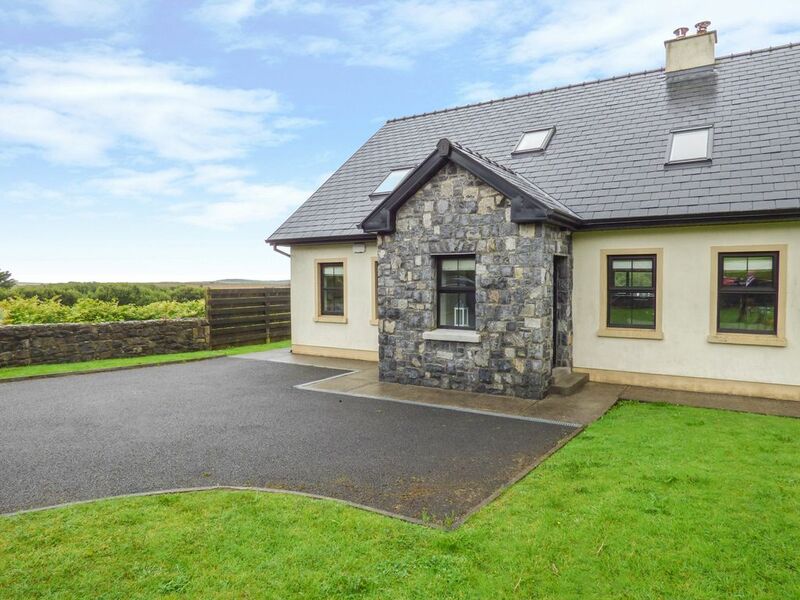 This detached cottage is close to the town of Lisdoonvarna near to Lahinch and can sleep ten people in four bedrooms. 2 Cois Cloiche is a lovely detached cottage situated just outside the town of Lisdoonvarna and nine miles from Lahinch in County Clare, Ireland. The cottage can sleep 8 people in four double bedrooms (two with en-suite shower rooms) together with a family bathroom. Also in the cottage is an open plan living area with kitchen, dining area and sitting area. Outside is ample off road parking and a private enclosed lawned garden. 1 Cois Cloiche is a superb base from which to explore this beautiful part of the country. Amenities: Oil central heating. Electric oven and hob, microwave, fridge, freezer, washing machine, tumble dryer, dishwasher, TV with Saorview. Fuel and power inc. in rent. Bed linen and towels inc. in rent. Ample off road parking. Enclosed lawned gardens. Sorry, no pets and no smoking. Shop and pub 10 mins walk. Note: The bed in one of the ground floor double bedrooms is accessed from one side only. Note: no children under 12 and no infants. No hen or stag parties or similar. Town: Lisdoonvarna is Ireland's premier Spa town, situated in the Burren region of County Clare, and is home to the Spa Wells Health Centre, the only active spa centre in Ireland, boasting a Victorian pump house, sauna, massage room and mineral baths, situated in woodland surroundings. The town is also home to the 150 year old Matchmaking Festival, which takes place every year during September. Attracting thousands from around the world, the festival offers music and dancing and finishes with the grand final where the best matched couple are awarded the coveted titles of "Mr Lisdoonvarna" and "Queen of the Burren"! Lisdoonvarna has eight pubs, some offering traditional Irish music, and good shops and restaurants. Five bedrooms: 2 x double (one with en-suite shower, basin and WC), 2 x ground floor double (one with en-suite shower, basin and WC). Bathroom with bath, shower over, basin and WC. 1x Bunk Room Ground floor basin and WC. Open plan living area with kitchen, dining area and sitting area. Utility. Oil central heating. Electric oven and hob, microwave, fridge, freezer, washing machine, tumble dryer, dishwasher, TV with Saorview. Fuel and power inc. in rent. Bed linen and towels inc. in rent. Ample off road parking. Enclosed lawned gardens. Sorry, no pets and no smoking. Shop and pub 10 mins walk. Note: The bed in one of the ground floor double bedrooms is accessed from one side only. Note: no children under 12 and no infants. No hen or stag parties or similar.